Up close, pressed against the stage on Saturday night, Wild Flag were once again awe-inducing. They are amazingly tight for a band that has just barely been together. What seems to be my problem with the album, that there isn’t enough room for it to breathe, is an asset live. There is little chatter, the occasional “how are you all doing” seems more like an afterthought, not in a bad way, but because they are so immersed in each other and what they are doing. They careen from song into song. Everybody plays. Everybody sings. Everybody dances. Mary Timony raises her guitar in the air and above her head and into the amps, generating feedback. Janet Weiss remains one of my favorite drummers ever to watch, I could pick her style out blindfolded. Rebecca bounces behind the massive keyboard. 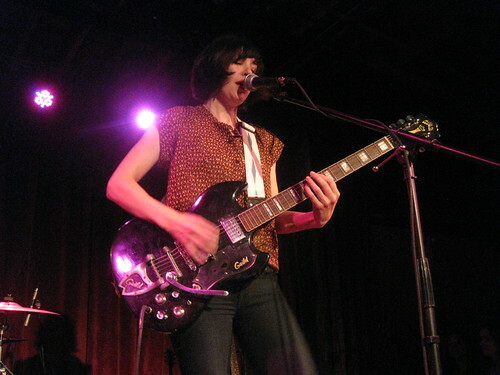 And Carrie Brownstein, is a guitar hero more than ever. More than ever, she is mixing Patti with Pete and watching her windmill over her SG was one of those OH MY GOD moments. There were girls over my left shoulder dancing and screaming and waving their arms in the air every time she kicked a leg out. If there was a negative, it was that there aren’t enough songs yet, even extending some of the interludes on the songs from the album doesn’t quite do it for me. I want more. I need more. It felt like we were just getting started when they walked off the stage and came back on again, three sharp chords in a row and I high-five a friend as they zoom into “See No Evil,” right, fitting and proper, although far more physical than Television ever would have been, it was just right. Will see them in a few weeks. Saw them at a dinky club last year. I heart Janet so much, I know just what you mean.